Bicycling across any state, big or small, is quite a feat! However, the Hawkeye State has turned it into an art form! Every July the Des Moines Register organizes and hosts the Register’s Annual Great Bicycle Ride Across Iowa, better known as RAGBRAI. Back in 1973 it was the harebrained idea of two intrepid newspaper reporters who rode across the state. Held every year since it has become an Iowa tradition. Changing the route year-to-year over the past 44 years it has passed through 800 towns and peddled across all 99 Iowa counties. The ride has grown from some 300 riders to over 10,000 riders each day of this seven-day odyssey, peddling the 450 to 500 miles from the Missouri River to the Mississippi. It is the longest, largest, and oldest bicycle tour event in the world, but folks are really interested in what it is like to experience RAGBRAI. My second RAGBRAI began in late-May, 2016, after a phone call from some cycling friends. Having ridden with them four years ago they wanted to fill two open spots on their team. I knew what I was getting myself into, but was worried registration would be a problem, which had opened in November and was limited to 8,500 weeklong riders and 1,500 day riders. Entries usually exceed the limit, so a random lottery selects participants and registration had long since closed. However, lottery winners invariably end up with conflicts, injuries, and other reasons to sell their registration to late or last minute riders like myself, so within two weeks I registered and was able to transfer the purchased pass into my name. Teams are encouraged and a whole culture has developed around this event reflected in the long-standing traditions, such as dipping the rear tire in the Missouri River at the start and front tire in the Mississippi River at the end. Wacky team names and groups have been created like Team Shagbrai and their moniker Do Our Bikes Make You Horny? Similarly, purpose built vehicles are prevalent, like the custom painted green school bus of Shagbrai featuring an image of Mike Myer’s Dr. Evil. 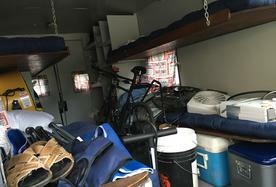 Atop these team busses and vans are usually elaborate upper decks to hold bikes, equipment, and additional supplies, while the interiors often include bunks and some kind of shower arrangement inside or off the back. Since 1,000 base miles is recommended to prepare for the ride I viewed having 9-10 weeks to train as critical to be comfortable. Breaking this down into 100-mile weeks make it manageable, and although I actually only got in about 750 miles and my two longest rides were no more than 50 miles, it proved sufficient. What most people don’t explain is that you DO get stronger throughout the week. The trick is to ensure each day you get a good post-ride recovery (hydrate, replace electrolytes, and good food) and a good night’s sleep. Besides the designated town stops many vendors setup day-to-day along the route, typically at the top of a hill to do business supporting the ride. Several notable vendors return year-after-year like Mr. Porkchop, Tom’s Tender Turkey, Beekman’s Homemade Ice Cream, and various homemade pie stands. 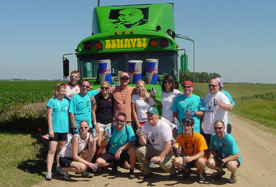 The most recent addition and popular, the Iowa Craft Beer Tent, is strategically placed within the last 5-10 miles of each day’s route. Each rider has his or her favorite vendors to patronize during the ride once or twice during the week or in some cases every day. The entire experience is connected by bicycling as the route, riders, host towns, and vendors vary day-to-day and year-to-year. The beautiful thing as a cyclist is the route is always well marked, nearly impossible to get lost on, well supported, and the roads are almost entirely closed to vehicles leaving both lanes free to us cyclists. Plus the Iowans are so damn friendly and there are always other riders on the route for conversation, fun, and ability to meet new people from all over the U.S. and many foreign nations. Slower riders are expected to ride on the right and faster cyclists buzz along frequently calling out, “On your left,” or, “Left,” as they approach to let others know they are passing or need room to pass safely. The Iowa State Patrol does a great job guarding the major intersections and regulating bike and automotive crossings. Also the roads are generally in great shape, but as on any bike ride you are constantly on the lookout for other cyclists, holes, cracks, gravel, or the occasional road kill to avoid. Many of the roads are beautiful smooth concrete ribbons for great riding, however the inevitable center crack is the “catch” to take an unwary rider down. Inside the Chevy Apache — bunks & gear. Feeling strong after three days of very hilly riding, Wednesday included the optional Karras Loop (named after one of the ride founding reporters, John Karras and Don Kaul) turning a 68-mile day into 99 miles. I could not resist riding hard, jumping into and getting dropped from a couple pace lines after taking more than my share of pulls at the front. About mile 90, I bonked on a long hill and dropped off a pace line organized by a couple from Colorado. With noodle legs, I stopped for ice cream and Gatorade in Mystic, Iowa. Then struggled up every hill or incline for the last nine miles. After a shower, some food, and a cold beer I checked my bike computer discovering an average speed for the day of 17.2 mph (not including stops). Thursday, proud but tired, became a recovery ride of 52 miles. Friday’s 68.5 miles started slow spinning and talking without any real ambitions beside enjoying the day. With one of my teammates, Steve, we ran into the couple from Colorado, chatted for at least 5-10 easy miles until they picked up the pace. We were soon riding tempo (19-23 miles an hour) rotating through a pace line. With a final sprint we stopped at the Iowa Craft Beer Tent chatted some more three beers later Steve, Mark (another team member), and I rolled through the last few miles at an easy pace. Surprised at how hard we had ridden it was a second daily average of 17.2 mph. I paid for all the hard riding limping through the last day of a great week of cycling satisfied I had thoroughly test my limits. RAGBRAI begins on a Sunday, so the Friday before I packed each day’s riding shorts/bibs, jersey, dirt bar(s), socks, and gloves in a 1-gallon Ziploc baggie and with my post-ride clothing pack all this into a canvas bag. Camping equipment including an inflatable air mattress went into another. Added to this was my bike, helmet, cycling shoes, and repair equipment with a spare inner tube. I was nervous and excited at the prospect, challenge, and opportunity to just have one thing to do each day for a week – ride my bike 50 to 100 miles. Months in advance well organized teams arrange hotels, host families, schools, even funeral homes to stay indoors and camp on lawns from town to town. Iowans along the route are so very gracious, typically opening their homes to riders, as we greatly appreciate use of their bathrooms and showers. 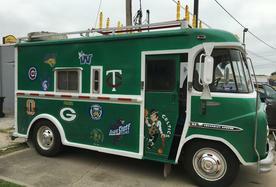 An array of vehicles, campers, customized team busses, and trailers support the riders carrying their gear along the route. There are also private logistics services specifically for RAGBRAI providing gear, tents, and shower trailers to support the riders. Each afternoon tent cities pop up and are torn down the next morning and move from town to town throughout the week. Friday evening I met the well-run Team Stuffed Pickles at the organizing couple’s house in the suburbs to pack the trailer and 12-person rental van. We left early Saturday morning for western Iowa and stayed at a motel about 20-minutes from the start town. Rolling out early Sunday for the first day’s ride of 50 miles from Glenwood to Shenandoah. Thus began the morning ritual of waking up early, packing gear, hitting the bathroom, getting dressed in cycling gear, tuck nutrition bars, course map, directions to our overnight spot, and money into jersey back pockets, putting on gloves and helmet, filling water bottles, topping off bike tires with the hand pumps, and rolling out onto the route. Rollout time is typically between dawn and 9 am depending on the expected distance and temperatures. Each team’s support or sag driver(s) usually pack up the breakfast spread and throw bags into the vehicle or trailer and drive to the next overnight spot to setup for the arrival of the riders, who begin rolling in by mid-afternoon. The infamous rumble strips near intersections unnerve many, and most riders swerve to avoid these and point or call them out for the riders behind. Throughout warning shouts of, “Rumbles,” “Rider on,” “Rider off,” “Car up,” or “Car back,” are heard along the route. Bicycling regularly has its risks and even the best riders experience a few crashes. Coming across a crash scene tightens the gut and like a wet blanket covers us with a collective concern and anxious quite for the next mile or so before lifting. Riders immediately assist anyone who has fallen, but the best most of us can do is carefully clear the area and keep peddling. If needed a motorcycle paramedic or ambulance soon arrives. At the end of the week as riders rolled in to dip their front tires in the Mississippi, I noted many smiling folks with telltale elbow and knee bandages. Sadly this year two people died on the ride, which has to be a risk for any event of this magnitude. The first two days are the most hairy as new riders get used to the experience, and everyone is nervous cycling with so many unknown cyclists. Plus, there are a lot of breakdowns – mostly flat tires. One of the coolest things is Team U.S. Air Force, 140 riders strong and quoted as saying, “We signed up to serve.” They certainly do selflessly interrupting their rides and pulling off to assist any cyclists with a breakdown or problem. Each year they hand out hundreds of spare inner tubes, especially on the first two days, as it is common to see Air Force riders in their matching jerseys bunched at the side of the road helping someone. This safety net adds a certain camaraderie, togetherness, and friendly support to the entire event. Iowa is filled with rolling hills of corn, farms, small towns, and friendly Midwesterners. It is definitively not flat and food is important on RAGBRAI and dominated by the local cuisine of pork, homemade pies, and beer. However, as the ride has evolved healthier options like smoothies, grilled meats & veggies, and chocolate milk (a great recovery drink) have become more prevalent. Burning so many calories bicycling builds an appetite and my typical day started with a reasonable breakfast (yogurt, eggs or cereal) before riding, then two lunches at the pass through towns mid-morning and in the early-afternoon (a smoothie, stir-fry rice bowl, veggie pizza, burger, or pork loin sandwich), a post-ride snack, a beer or two, and dinner. It is hard to lose weight on RAGBRAI because you are so hungry, but most riders at least trade fat for muscle and leave in better shape then when they arrived. It took three to four days after completing RAGBRAI to begin to feel normal again and I greatly appreciated sleeping in my own bed, but missed the simplicity of getting up and cycling every day. The bummer was catching a cold and missing several days of work, regardless I was soon itching to catch a group ride and test my legs. I am pleased to report I definitely returned better, faster, and stronger and my cycling has shifted. Before RAGBRAI, 40 or 50 miles was a long ride. Now I’d its no big deal to do a 60 to 100 mile ride. My ultimate takeaway from RAGBRAI is — there is a RAGBRAI for everyone. Almost anyone can participate – whether as a support driver, a local riding “bandit,” a half-week rider who talks a good game but loves the Sag Wagon, one of the hardy few drinking their way across Iowa, or as a friend or family member sharing in the camaraderie to support a team. There are the many vendors, organizers, and host families who participate in the success of this annual postcard for Iowa hospitality. In short, this cycling crazed, weeklong peddle-fest called RAGBRAI is a ton of fun! It attracts great people, and is an experience for most anyone to be part of at least once! “Build it and they will come,” and year after year they do for a week in July across Iowa; that is RAGBRAI. This entry was posted on Friday, August 19th, 2016 at 1:44 pm and is filed under Uncategorized. You can follow any responses to this entry through the RSS 2.0 feed. Both comments and pings are currently closed.